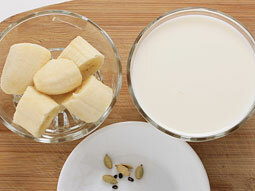 Banana and milk are rich source of calcium and smoothie prepared with them can provide the majority of body’s daily need of calcium in single go. Banana smoothie without yogurt is a nutritious and calcium rich drink prepared by using just three ingredients, banana, milk and honey. 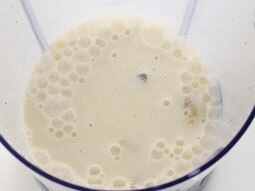 This recipe carefully avoids the use of ice as well as ice cream to make it suitable for kids. However, if you are not making it for kids, then you can add ice in its preparation. Peel and chop banana into big pieces. 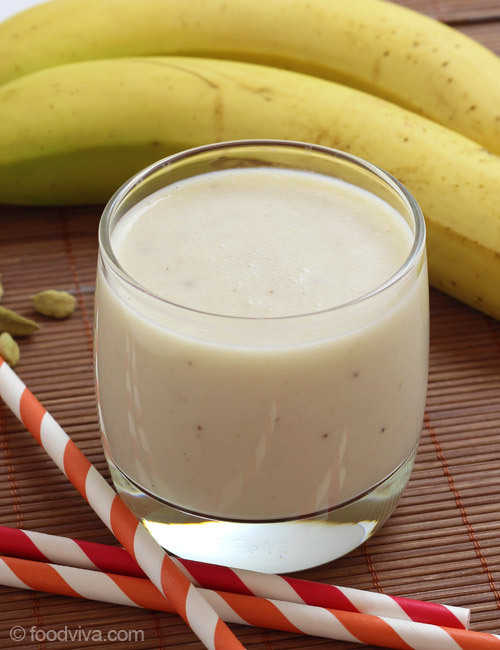 Add banana, milk, cardamom powder and honey in a blender jar. Blend until smooth and there are no fruit chunks. 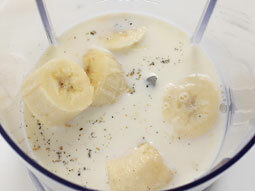 Yogurt-less banana smoothie for kids is ready. Pour it into serving glass, garnish with banana wheel on the rim and serve. Do not add ice cubes, sugar or ice cream while preparing it for toddlers. Add a pinch of mace powder instead of cardamom powder for variation. Use of cardamom powder /saffron is optional, you can avoid it if you want to. Adjust the quantity of milk to make it thick or thin accordingly. Serving Ideas: The absence of ice, yogurt and ice cream in this smoothie makes it suitable to be served in the breakfast as healthy drink. However nothing can stop you from having anytime you like it. It was delicious! Like another person who commented I used two tablespoons of honey instead of teaspoons. And I actually used a pinch of ground cinnamon and a few cubes of ice to make it colder. I was impressed with this simple recipe. Response: Thank you Jillian for the feedback and tip. OMG I cannot even begin to say how good this is. 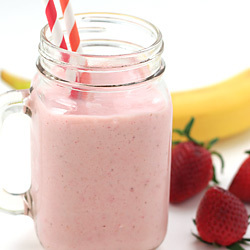 I added protein powder to mine as well and it is definitely my all time favorite smoothie. OMG!!! I love this...it was so good. I added some peanut butter and it just added a rich and smooth taste. I tried this and it was delicious! I did a tablespoon of honey instead of two teaspoons. It really fills you up too! Oh my god this is delicious. I added peanut butter just for a little bit more flavor and protein. I used this recipe and it is delicious even though the milk had to be substituted. Regular almond milk tastes nice and with around a handful of blueberries it made it a bit better in taste for my sister and I. Thanks for sharing these recipes hope these recipes help my kids.